The objective of this study was to evaluate iron bioavailability of maize genotypes, and analyze the correlation between in vitro and in vivo methods. Dialysable iron was analyzed in 13 genotypes from which 5 were selected for the biological assay. Mean iron content of the genotypes (n=13) was 17.93±2.93 mg kg-1. Phytate varied from 0.77% to 1.03%; phytate: iron molar ratio from 30.64 to 55.41; and soluble iron from 13.17 to 39.63%. The highest value for dialysable iron was 19.14%. In the biological assay, the control group, that received ferrous sulphate, did not present significant difference between the genotypes for Hb gain, Hb gain per gram of iron consumed and HRE. Hb gain did not present a significant correlation with in vitro assay. However, there were positive correlations varying from 0.653 to 0.809. The maize genotypes evaluated presented a good bioavailability since the genotypes showed the same result in hemoglobin gain than control group. O objetivo deste estudo foi avaliar a biodisponibilidade do ferro de genótipos de milho e analisar a correlação entre métodos in vitro e in vivo. Ferro dialisável foi analisado em13 genótipos, a partir do qual 5 foram selecionados para o ensaio biológico. A média de teor de ferro dos genótipos (n= 13) foi 17,93 ± 2,93 mg kg-1. O teor de fitato variou de 0,77% a 1,03%; razão molar fitato:ferro de 30,64 a 55,41; e ferro solúvel de 13,17 a 39,63%.O valor mais alto para o ferro dialisável foi 19,14%. No ensaio biológico, o grupo controle, que recebeu sulfato ferrso, não apresentou diferença significativa entre os genótipos no ganho Hb, ganho de Hb por grama de ferro consumido e HRE. Ganho de Hb não apresentou correlação significativa com o ensaio in vitro. No entanto, houve correlações positivas variando de 0,653 a 0,809. Os genótipos de milho avaliados apresentaram uma boa biodisponibilidade uma vez que os genótipos apresentaram o mesmo resultado quanto ao ganho de hemoglobina em relação ao grupo controle. Federal University of Viçosa, Viçosa – Minas Gerais, Brazil. Federal University of Espírito Santo, Alegre – Espírito Santo, Brazil. Embrapa Maize & Sorghum. Sete Lagoas – Minas Gerais,Brazil, São Paulo University, São Paulo – São Paulo,Brazil. According to the World Health Organization, approximately 2 billion people are anemic, accounting for 24.8% of the world population, in different social strata. Nine in ten people that are anemic live in developing countries, and around 50% of the cases can be attributed to low intake of bioavailable iron (1). Food fortification is an alternative to reduce iron deficiency anemia, although this strategy does not accomplish satisfactory results in rural and poor areas, where access to industrialized foods is limited. Another factor that has contributed for the failure of the fortification program is the use of low bioavailable salts, or salts that interact with the food matrix. Besides, there is a lack of supervision regarding the right amount of salt that should be added into the product (2-3). Biofortification may be another alternative to provide food with greater bioavailable iron content (4). This intervention program could reach rural populations that do not consume or consume small quantities of industrialized fortified foods. Biofortified genotypes have the potential to provide continuous benefits to developing countries, with time. In Brazil, research and development of biofortified maize lines with high content of iron, zinc and carotenoids was started in 2004 at Embrapa Maize and Sorghum, as part of a worldwide generation of biofortified crops called Harvest Plus. The national project is being directed to tropical regions, especially in the generation of genotypes adapted to planting in semi-arid regions, since in the Northeast of Brazil it is high the prevalence of nutritional deficiencies. This crop was selected because it is widely consumed in poor regions of the world. The production of maize in Brazil in 2011/12 was 70 million tons, in South Africa 11,5 million tons and Mexico 19 million tons. The consumption in the three countries were 54 million tons; 10,7 million tons and 29,7 million tons, respectively. This data shows the importance of this grain worldwide. Enhancement of food mineral content by biofortification requires the evaluation of its bioavailability. Different techniques may be applied to evaluate iron availability, including in vitro methods, such as dialysis, which simulates body digestion (5) and in vivo methods, using either animals or human beings. For the in vivo methodology using animal models, the hemoglobin depletion-repletion test proposed by AOAC (6) is recommended and widely used. Mineral bioavailability evaluation is important to verify whether the biofortification program will achieve its aims. Nevertheless, the utilization of in vivo techniques in these programs is unfeasible due to the large number of materials to be evaluated, and to the small amount of sample available at the initial phases of the studies. Thus, as an alternative to detect the genotypes presenting promising features, the use of in vitro techniques, such as dialysis, is suggested, as they are less expensive and easier than the in vivo methods. Therefore, this study aimed to evaluate iron bioavailability of maize genotypes using in vitro and in vivo methods, and to verify whether there was any correlation between them. Maize genotypes provided by Embrapa Maize and Sorghum Plant Breeding Program (Sete Lagoas, MG, Brazil) were used in this study. Iron bioavailability of 13 genotypes were analyzed by the in vitro method. For the biological assay, five genotypes were selected based on genotypes containing at least 13.86 mg kg-1 of iron in order to provide diets with 12 mg kg-1 of iron after the addition of the essential ingredients ironfree mineral mix, vitamin mix, choline bitartrate and L-cystine. The maize kernels were dried in a forced ventilation oven, Adamo, model 960-PID, 65°C for 24 h and milled after cooling. The flour obtained was kept in a polyethylene bag at 4°C. The dialysis tubes (dialysis tubing, high retention steam-less cellulose tubing, average flat width 32 mm D0530-100FT, Sigma-Aldrich) were previously prepared, according to the manufacturer instructions. Dialysable iron was analyzed in 13 different genotypes (Table 2), according to the method proposed by Miller et al (5), with some adaptations (Figure 1). The technique consisted of a simulation of the digestion and absorption that occur in the digestive system. The enzymes used were pepsin (VETEC – code 1221), pancreatin (VETEC – code1220), and bile extract (Sigma-Aldrich – B8631). 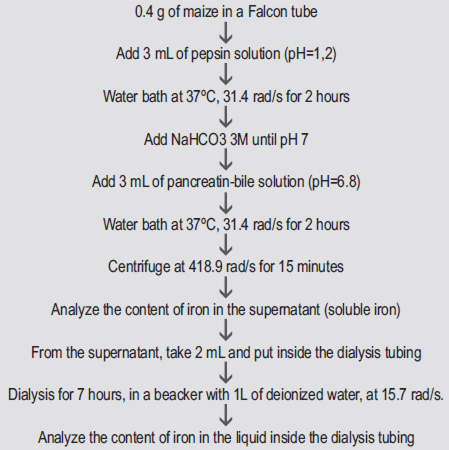 Dialysable iron content was calculated by the difference between soluble iron (mineral content in the liquid after the digestion procedure) in 2 mL and the content of iron inside the dialysis tubing after 7 hours of dialysis. This calculation provided the amount of iron that passed through the tubing. Iron content in the supernatant and inside the dialysis tubing was analyzed using graphite furnace atomic absorption spectrometry (Simultaneous Multi-element AA Spectrometer. SIMAA 6000, Perkin Elmer). The dialysis time was increased to 7 hours, instead of the 2 hours proposed by Miller et al. (5), due to the small content of dialysable iron in this type of food. The 2-hour dialysis did not provide sufficient amount of dialyzed iron to compare the samples. Previous and unpublished studies carried out at the IQ/USP laboratory, showed that within the period of 7 hours all dialysable iron could pass through the dialysis tubing. Moreover, the intent of the in vitro method was the pre-selection of genotypes that will be used for further studies, in the development of other genotypes with increasing levels of bioavailable iron, and as well as for the selection of genotypes that will be studied in animals and subsequently in humans. So, this methodology will be used for screening the best genotypes to be studied further more. In subsequent studies, genotypes with high content of bioavailable iron will be developed, and possibly the normal protocol of two hours could be applied. However, these are just initial studies for the development of maize with higher content of iron in Embrapa, that is the reason of such small differences between the genotypes. Iron analysis was performed with a graphite furnace atomic absorption spectrometry (Simultaneous Multielement AA Spectrometer. SIMAA 6000, Perkin Elmer), which allows quantification of small amounts of the mineral (ppb). The samples were prepared using a microwave oven (Microwave Sample Preparation System, Multiwave 3000, Anton Paar). The values 659.91 and 55.8 correspond to phytate molecular weight and iron atomic weight, respectively. The study was approved by the Animal Experimentation Ethics Committee of the Federal University of Minas Gerais (CETEA/UFMG) (Protocol no. 112/2009). The chemical composition was determined in all 5 maize samples used in the biological assay. The following composition characteristics were determined: moisture (8), ash (6), total protein (6), total lipids (8), carbohydrate (6), and total and insoluble dietary fiber, using an enzymatic-gravimetric method (6). Soluble fiber was calculated by subtracting insoluble fiber value from total fiber value. These data were used to establish the quantity of albumin, dextrinized cornstarch, sucrose, soybean oil, cellulose fiber, and cornstarch to be added to the diet, in order to provide an isocaloric diet with the same content of macronutrients. Maize genotypes and diets iron content were determined by flame atomic absorption spectrometry, spectrometer GBC 908 AA, after digestion of the samples with concentrated nitric acid in a digestion block at 150°C for 16 hours (6). All glassware used were washed, rinsed with distilled water, soaked in 10% nitric acid overnight, and rinsed with deionized water. a Prepared at the Experimental Nutrition Laboratory-UFV-MG-Brazil. b Each diet was composed of a different maize genotype. Weaning Wistar male rats (n = 48), aged 21 days, provided by the Central Animal Breeding Program of the Federal University of Viçosa, MG-Brazil, were used in this study. Their initial mean body weight was 57.91 ± 2.37 g, and they were housed in individual stainless steel cages in an environmentally controlled room, with 12 hour light/dark cycle at 21 ± 1°C. Body weight gain and food intake were monitored weekly in both phases, and they were used to calculate the Feed Efficiency Ratio (FER = [weight gain (g)/feed intake (g)] x 100). The animals were fed a modified AIN-93G diet (9) containing iron-free mineral mix and deionized water ad libitum for 21 days to induce anemia. At the end of this phase, hemoglobin was determined, and the animals were divided into 6 groups of 8 each, taking into account the level of hemoglobin of each animal, so the mean hemoglobin between groups would be close. 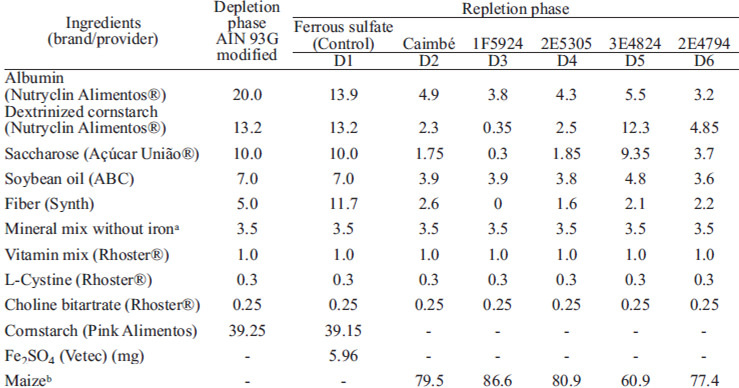 At this second stage, iron sources were the different maize genotypes for the five test groups, and one group received ferrous sulfate (control group). The maize genotypes used in each group were: Caimbé, 1F5924, 2E5305, 3E4824 and 2E4794. The diets were calculated to contain 12 mg of iron kg-1 The animals received deionized water ad libitum, and an average of 14 g of diet daily, during 14 days. At the end, another hemoglobin measurement was carried out. Relative biological value of HRE was also calculated, dividing HRE values of the test group by the value of the group that received ferrous sulfate as iron source (RBV of HRE). The data followed a normal distribution. Analysis of variance (ANOVA) and the Dunnet test post hoc were performed to compare the test groups with the control group; and the Tukey test post hoc to compare the test groups, at p < 0.05. The Pearson correlation test was used to verify the correlation between phytate content and iron availability/bioavailability parameters; hemoglobin gain and HRE; and the relationship between data of biological and in vitro assays, at p<0.05. Statistical analyses were carried out using the SigmaPlot software, version 11.0. Total, soluble, and dialyzable iron content and phytate and phytate:iron molar ratio are shown in Table 2. Approximately 42% of soluble iron was dialyzed in all genotypes, except for 3E4824, whose value was 24%. Phytate and phytate: iron molar ratio did not correlate with any value obtained in the in vitro assay, except for μg g-1 of soluble iron (r = 0.577). Soluble and dialysable iron in μg g-1 and in percentage were significantly correlated (r = 0.944 and r = 0.951; respectively). Chemical composition of genotypes used in the biological assay is presented in Table 3. The samples had similar chemical composition and their insoluble fiber content was higher than that of the soluble fraction. TABLE 3 Chemical composition of maize genotypes used in the biological assay, in a dry weight basis (g 100g-1). There was a difference in iron content between the diets during the repletion phase (Table 4). When comparing all groups with the control, only Caimbé diet did not differ from the control (Ferrous sulfate), while the other test diets had lower iron content than the control group, by the Dunnett test (p<0.05). Comparing only the test groups, it was observed that 3E4824 diet had a lower iron content than Caimbé, 1F5924 and 2E4794 diets; and Caimbé diet had a higher content than 2E5305, 3E4824 and 2E4794 (Table 4). Due to these differences in the iron content of the diets, the use of HRE was important as it eliminates this confusing factor, by measuring the hemoglobin gain in relation to the iron intake. There was no difference in weight gain, feed intake and FER between the groups in all the phases of the assay. All groups, except for 1F5924, had an iron intake different from the control group, due to different content of iron in the diets. The Caimbé group was the only one that presented higher iron intake when compared to the control group. Comparing only the test groups, they all had different iron intake, with Caimbé having the highest intake and 2E4794 the lowest (Table 4). These results reaffirm the need to evaluate the hemoglobin gain in relation to iron intake. In the beginning of the repletion phase, the mean hemoglobin value was 5.91±1.30g dL-1. There was no significant difference in the initial and final hemoglobin values between groups. Hemoglobin gain per gram of iron consumed was higher in the 2E4794 group, and lower in the control group, although not at a significant level (Table 4). All groups had HRE greater than the control group, except for Caimbé. Otherwise, analyzing only the test groups, there was no difference between the groups, and RBV indicated that the 3E4824 and 2E4794 groups had the best values of HRE. The Caimbé group, which presented the highest iron intake, showed the lowest RBV value (Table 4). There was no relationship between iron intake and hemoglobin gain. However, there was a positive and significant correlation between hemoglobin gain per gram of iron intake and HRE (r = 0.883; p < 0.001), and between hemoglobin gain and HRE (r = 0.723; p < 0.001). In this study, hemoglobin gain and HRE did not present any significant correlation with phytate and phytate: iron molar ratio. Hemoglobin gain per gram of iron intake and HRE did not correlate with any results from the in vitro assay. Hemoglobin gain did not present a statistically significant correlation with any in vitro assay value at 5%. However, there were positive correlations with pvalues, ranging from 0.653 to 0.809 (Table 5). TABLE 5 Correlation estimates between hemoglobin gain and in vitro assay results. Simic et al. (11) studied the genetic variation of iron content in maize population as part of a biofortification project in maize at the Agricultural Institute Osijek, Croatia and found a mean value of 24.20 mg kg-1., while Abebe et al. (12) found a mean value of 44 mg kg-1, both higher than the values found in this study. These differences in iron content can be due to the variability in iron content of the soils, a factor that affects the total iron content of plant foods (4). Besides, each study analyzed different maize genotypes which indicate the genetic variation among maize iron. This fact indicates the feasibility of developing maize genotypes with higher amount of iron. Lorenz et al. (13) and Abebe et al. (12) reported higher phytate contents in maize than those found in this study (1.15% and 1.44%, respectively). The study of Lorenz et al. (13) used colorimetric methodology and Abebe et al. (12) used high performance liquid chromatography (HPLC). It is reported in the literature that AOAC and other colorimetric methods overestimate phytate values because they quantify inositol mono-, bi-, tri-, tetra-, penta- and hexaphosphate and other phosphates, such as nucleotides with phosphorus and adenosine triphosphate; while the HPLC method quantifies only inositol tri-, tetra-, penta- and hexaphosphate (14). It is known that only inositol pentaand hexaphosphate inhibit iron absorption (14), and AOAC and other colorimetric methods do not quantify these fractions separately. Nonetheless, the values found using colorimetric or HPLC method were similar for maize sample, indicating that, the colorimetric method can be used to obtain an approximate value of phytate content when HPLC method cannot be used (15). This could be explained by the fact that approximately 95% of maize phosphorus is in the form of inositol penta- and hexaphosphate (15). This fact indicates that the genotypes analyzed in this study achieved smaller quantities of phytate than others studied around the world. Despite the value found for phytate:iron molar ratio, the biological assay results indicate that maize iron was as bioavailable as ferrous sulfate, since both promoted the same hemoglobin gain and HRE. Based on this study, phytate:iron molar ratio did not reflect iron bioavailability since the diet with ferrous sulfate did not have phytate in its composition. Nonetheless, it is important to emphasize that iron absorption is higher in the rat model than in humans, since it is less influenced by dietary factors that inhibit non-heme iron absorption (18). However, it was not considered a study in humans, since improvement in the iron status can only be noticed in humans who are already deficient in iron. Besides, it is unethical to submit human beings to a diet which may not improve their health. Phytate: iron molar ratio was expected to influence iron bio-accessibility measured by the in vitro method, since phytate is known to affect iron bioavailability, but no correlation was found. This could have happened because there was a small difference in phytate:iron molar ratio between the genotypes studied, which varied from 30.64 to 55.41. The in vitro assay results were not influenced by the total iron content of the samples; thus, iron content did not determine soluble and dialyzable iron (Table 2). No significant correlation was found in the biological assay between iron intake and hemoglobin gain and HRE, indicating that a higher intake does not necessarily implies in higher iron absorption and bioavailability. Felix and Canniatti-Brazaca (19) evaluated dialyzable iron in soybean and did not find a positive correlation between iron content and dialyzable iron, either. According to the literature, no agreement has been reached regarding the influence of total iron content and its bioavailability; nonetheless, biological assay results of the present study indicated that this correlation does not exist. Therefore, increasing iron content of foods is not sufficient to increase bioavailable iron, reinforcing the need of bioavailability studies to evaluate the results of new genotypes developed in breeding programs. Carotenoids in maize may have influenced the results of bioaccessibility/bioavailability but they were not quantified in this study. Different carotenoid contents varying from 2.01 to 19.63 mg kg-1 were found in samples analyzed in Santa Catarina, Brazil (20), and 9.33 mg kg-1 in maize flour from Italy (21). Carotenoids, mainly the ones with pro-vitamin A activity, affect iron absorption positively since they form soluble complexes with the mineral, providing a higher amount of soluble bioavailable iron for gut absorption (4). The group that received the genotype Caimbé presented the highest iron intake but not the highest hemoglobin gain and HRE, still presenting the lowest RBV value, indicating that this genotype possibly contains some compounds affecting iron absorption, such as polyphenols, which were not evaluated in our study. kuhnen (20) reported a polyphenol content ranging from 516.29 to 1,132.04 μg g-1 for maize samples. The group presenting the highest hemoglobin gain per gram of iron consumed received the genotype 2E4794, which indicates the best iron bioavailability. This fact could also be confirmed by the best HRE and RBV values. However, this sample also presented a higher content of phytate and phytate:iron molar ratio compared to the genotypes analyzed. An explanation for this result is the small difference in phytate:iron molar ratio between the genotypes used in the biological assay (varying from 41.67 to 55.89), which would not cause great differences between the group results. Thus, the use of genotypes with greater differences in phytate:iron molar ratio is suggested, as an attempt to verify the influence of this factor on iron bioavailability. Despite the higher phytate:iron molar ratio values of maize grains, hemoglobin gain and HRE of the genotypes were greater than those found in the control group, indicating an iron bioavailability similar to ferrous sulfate. The control group did not have any ingredient in the diet containing phytate. Possibly, carotenoid content with pro-vitamin A activity affected the results. HRE and hemoglobin gain per gram of iron consumed, and HRE and hemoglobin gain presented significant correlation in this study. The same results were found by Haro-Vicente et al. (22), indicating the possibility of using HRE and hemoglobin gain per gram of iron consumed instead of only hemoglobin gain, or in cases when feed or iron intake were not well controlled, since these two consider iron intake in the determination. Although phytate did not influence iron bioavailability in this study, the result should be evaluated with caution since the influence of this compound on mineral bioavailability is widely known by in vitro (23) and in vivo studies (14-24). 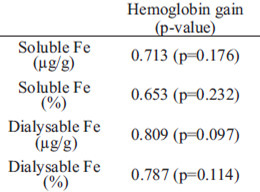 Even though hemoglobin gain did not present significant correlations with soluble and dialyzable iron, a positive correlation could be observed. Forbes et al. (25) found similar results between dialysis and clinical assay, indicating that this in vitro method could be a good alternative for a first iron bioavailability evaluation of feeds. The small quantity of genotypes analyzed in vivo, the small difference in iron content and phytate:iron molar ratio could be the reasons for the lack of statistical significance in the correlations. So, it could be suggested another study using larger amount of genotypes. Nevertheless, in this phase of plant breeding program development, it is difficult to produce great quantities of maize, and this was one of the limitations of the study. It was planned to analyze more genotypes of maize by in vivo method, nonetheless due to climatic conditions, less grains were produced. However, the maize genotypes studied presented good iron bioavailability, since the groups fed maize had the same results of the control group for hemoglobin gain, hemoglobin gain per gram of iron consumed and hemoglobin regeneration efficiency, in the biological assay. This emphasizes the importance of plant breeding programs in the development of cereals genotypes with higher amount of nutrients, which could help in the prevention and treatment of nutritional deficiencies. We thank Embrapa Maize and Sorghum, and Fapemig for the financial support, and CNPq for the scholarship provided for the MS. student. WHO - World Health Organization. Worldwide prevalence of anaemia 1993–2005 : WHO global database on anaemia. Geneva: WHO. 2008. Uauy R, Hertrampf E; Reddy M. Iron Fortification of Foods: Overcoming Technical and Practical Barriers. Nutri 2002; 132(4): 849S-852S. Meenakshi JV, Johnson NL, Manyong VM, Degroote H, Javelosa J, Yanggen DR, Naher F, Gonzalez C, García J, Meng E. How Cost-Effective is Biofortification in Combating Micronutrient Malnutrition? An Ex ante Assessment. World Development. 2010; 38(1): 64-75. Pixley kV, Palacios-Rojas N, Glahn RP The usefulness of iron bioavailability as a target trait for breeding maize (Zea mays L.) with enhanced nutritional value. Field Crops Research. 2011; 123: 153-160. Miller DD, Schricke BR, Rasmussen RR, Van Campen D. An in vitro method for estimation of iron availability from meals. Amer J Clin Nutri. 1981; 34: 2248-2256. AOAC - Association Of Official Analytical Chemists. Official methods of analysis of the Association of Official Analytical Chemists. (16ed. rev. 4).Washington, D.C. 1998. Haug W, Lantzsch H. Sensitive method for the rapid determination of phytate in cereals and cereals products. J Scie Food and Agri. 1983; 34: 1423-1426. Instituto Adolfo Lutz. Métodos físico-químicos para análise de alimentos. (4. Ed.) São Paulo. 2005. Reeves PG, Nielsen FH, Fahey JR GC. AIN-93 purified diets for laboratory rodents: final report of the American Institute of Nutrition ad hoc writing committee on the reformulation of the AIN-76A rodent diet. JNutri. 1993; 123(11): 1939-1951. Haro-Vicente J, Pérez-Conesa D, Rincón F, Ros G, Martínez-Graciá C, Vidal, M. Does ascorbic acid supplementation affect iron bioavailability in rats fed micronized dispersible ferric pyrophosphate fortified fruit juice? European JNutri. 2008; 47(8): 470-478. Simic D, Sudar R, Ledencan T, Jambrovic A, Zdunic Z, Brkic I, et al. Genetic variation of bioavailable iron and zinc in grain of a maize population. J Cereal Sci. 2009; 50: 392-397. Abebe Y, Bogal A, Hambidge kM, Stoecker BJ, Bailey k, Gibson RS. Phytate, zinc, iron and calcium content of selected raw and prepared foods consumed in rural Sidama, Southern Ethiopia, and implications for bioavailability. J Food Composi and Analysis. 2007; 20(3-4): 161-168. Lorenz AJ, Scott MP, Lamkey kR. Quantitative Determination of Phytate and Inorganic Phosphorus for Maize Breeding. Crop Science. 2007; 47(2): 600-604. Brune M, Rossander-Hulten L, Hallberg L, Gleerup A, Sandberg A. Iron Absorption from Bread in Humans: Inhibiting Effects of Cereal Fiber, Phytate and Inositol Phosphates with Different Numbers of Phosphate J Nutri. Groups. Journal of Nutrition. 1992; 122(3): 442-449. Raboy V, Gerbasi PF, Young kA, Stoneberg SD, Pickett SG, Bauman AT, et al. Origin and Seed Phenotype of Maize low phytic acid 1-1 and low phytic acid 2-1. Plant Physiology. 2000; 124: 355-368. Hallberg L, Brune M, Rossander, L. Iron absorption in man: ascorbic acid and dose-dependent inhibition by phytate. Amer J Clinical Nutri. 1989; 49(1): 140-144. Ma G, Jin Y, Piao J, kok F, Guusje B, Jacobsen E. Phytate, Calcium, Iron, and Zinc Contents and Their Molar Ratios in Foods Commonly Consumed in China. J Agri and Food Chemi. 2005; 53(26): 10285-10290. Reddy MB, Cook JD. Assessment of dietary determinants of nonheme-iron absorption in humans and rats. American J Clinical Nutri. 1991; 54: 723-728. Felix MA, Canniatti-Brazaca SG. Disponibilidade de ferro in vitro de grãos de soja tostados por diferentes tratamentos. Ciência e Tecnologia de Alimentos. 2008; 8: 78-83.
kuhnen S. Metabolômica e bioprospecção de variedades crioulas e locais de milho (Zea mays l.) [thesis]. Florianópolis, SC, Brazil: Federal University of Santa Catarina; 2007. Gentili A, Caretti F. Evaluation of a method based on liquid chromatography–diode array detector–tandem mass spectrometry for a rapid and comprehensive characterization of the fat-soluble vitamin and carotenoid profile of selected plant foods. J Chromatog A. 2011; 1218(5): 684-697. Haro-Vicente JF, Rez-Conesa D, Braqueh FR, Ros G. Iron absorption and haemoglobin status of rats fed a ferrous bisglycinate-fortified growing-up milk. J Sci Food and Agri. 2009; 89: 2107-2114. Frontela C, Haro JF, Ros G, Martínez C. Effect of Dephytinization and Follow-on Formula Addition on in Vitro Iron, Calcium, and Zinc Availability from Infant Cereals. J Agri Food Chem. 2008; 56: 3805-3811. Rong LI, kang-Ning W. Nixtamalization Effects on the Contents of Phytic Acid in the Varieties of Maize and the Bioavailability of Iron in Nixtamalized Maize to Young Pigs. Pakistan JNutri.. 2009; 8(6): 905-909. Forbes AL, Arnaud MJ, Chichester CO, Cook JD, Harrison BN, Hurrell RF, et al. Comparison of in vitro, animal, and clinical determinations of iron bioavailability: International Nutritional Anemia Consultative Group Task Force report on iron bioavailability. American J Clin Nutri. 1989; 49: 225-238.